How is it possible that Ana is 3 years old? It feels like just yesterday (but forever ago) that she was just this little squishy newborn. Ana is her own little person. She is like Zoe in some ways. They're both awesome sleepers. They're both awesome eaters. I swear they both potty trained themselves. Neither one claimed a security item... a woobie. Both loved/love their binkies. The list goes on. But... they are SO different too. My day seems to be spent playing opposites. Zoe wants milk, Ana wants juice. Zoe likes cucumbers, Ana likes tomatoes. Zoe wants to go outside, Ana wants to stay inside. Zoe wants ice cream, Ana wants a popsicle. Constantly different. Both girls definitely LOVE their birthdays and parties though. 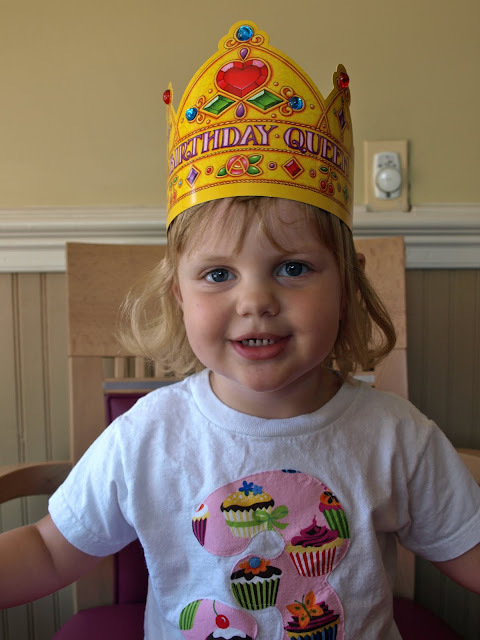 We had Ana's birthday at McCool's Ice Cream & Coffee Bar. They throw an awesome birthday party. 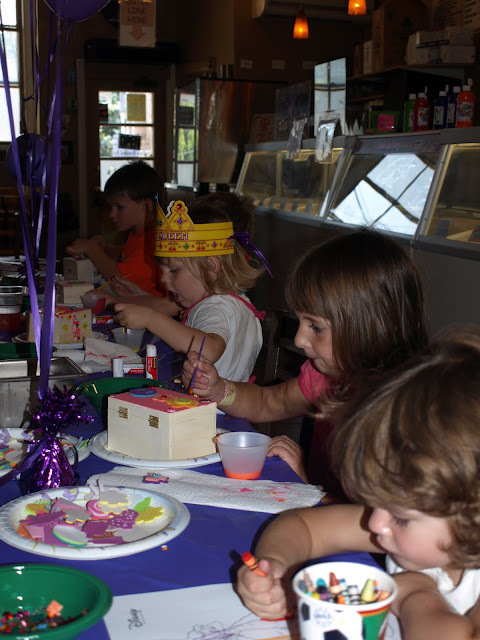 The kids do a craft, they color, they have pizza, they play a game or two, and instead of cake they have ice cream. 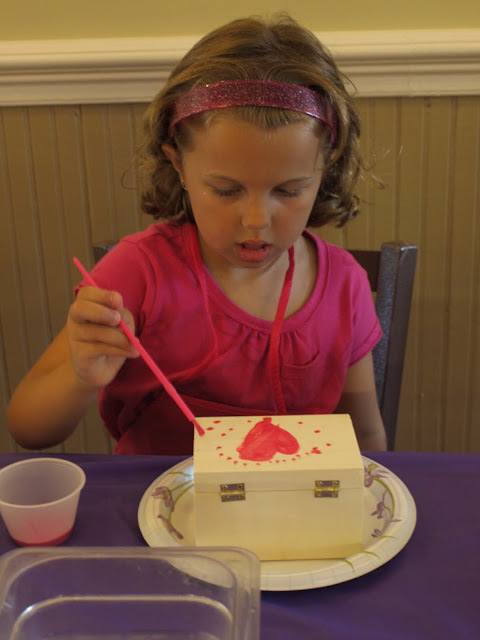 We picked painting treasure/jewelry boxes as our craft. It kept the kids so busy and quiet. I was amazed by how much they all concentrated. It was a good choice... because we had a really mixed age group for Ana's party. It was easy enough for the 3 year olds... but the 6-9 year olds got creative. There was a reason for the extreme mixed age group. You see... we joke that Ana doesn't like children. It isn't really quite that she doesn't like them though... it's just that she's extremely particular about who she likes. It's another way that Zoe and Ana are SOOO different. Zoe considers everyone her friend... she's so social... and her party guest list illustrated that. Ana... not so much. When I told Ana we were having her party she was excited, but when i asked who she wanted to invite she said "Nobody... just me." I could have said "eh, fine, no party needed" but she DID want a party. So, after some convincing coaxing she came up with 4 friends. (It became a sort of song... "I have 4 friends. 4 friends. I have 4 friends.") I added in the cousins... and 2 more friends, and then added the older siblings (who happen to be friends with Zoe). In the end... everyone had a great time. 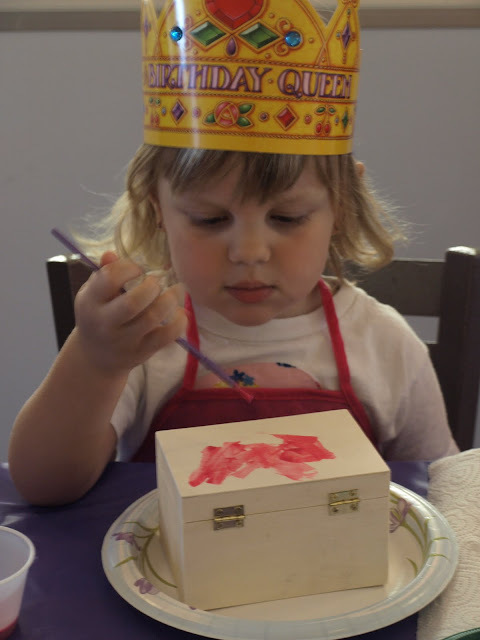 They all enjoyed the craft and playing "stick the cherry on the sundae". Everyone LOVED the ice cream (pick any flavor you want) and the toppings bar. Ana could very well be the best candle blower EVER (which could be thanks to bubble blowing lessons). I think we had a really nice party. We ended up with 4 families as guests. Everyone got along. Everyone had a good time. And just like that Ana is 3. No more baby. No more crib. No more diapers. A girl. A sweet girl with a sense of humor that makes me laugh until my stomach hurts. A girl that can make the meanest angry face and the smiliest happy face. A girl that gives the best hugs and says "I love you Mommy" in the sweetest way. Oh how I love this girl. *I'm extremely interested to see if this trend in friends continues. I picture Zoe in high school with this huge gang of friends. I picture Ana in high school with a small close knit exclusive group. I guess we'll find out in about 10 years.